Simon & Schuster, 9780743271486, 292pp. Travis Anderson has a psychic gift. Or so he thinks. So far he's used his premonitions only to acquire the external trappings of success -- pretty wife, big house, shiny Range Rover. But when ominous visions invade his consciousness, his yuppie contentment is threatened and his business faces an audit from the IRS. Drowning in mounting financial problems and apparent mental illness, Travis clings to a raft of booze and pills. An intervention lands him in a rehab facility with outlandish ideas about healing mind and body. His sole counsel is no 12-stepper, but a Hindu holy man who claims to be the final incarnation of Lord Vishnu, the Hindu god who is the preserver of the universe. "This book says more about the meaning of mankind than the Bible, the Bhagavad Gita, and The Hunt for Red October combined." "Lord Vishnu's Love Handles is mind-boggling and wonderful. It's the wackiest, craziest genre-defying, can't-put-it-down book I ever read. Will Clarke is part David Sedaris, part Dave Eggers, part Charlie Kaufman, Hunter S. Thompson, Tom Robbins, and Kurt Vonnegut...and a 100 percent original Will Clarke." "I loved Lord Vishnu's Love Handles. It's a great and unashamed page-turner, full of fabulous characters. I just wish remote viewers really were that interesting." "A twisted, hilarious, amphetamine-fueled parable for our time." 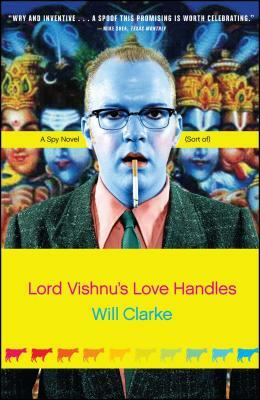 "Lord Vishnu's Love Handles is an entertaining and gritty journey into the supernatural, full of wit and surprises at every turn."